We mix the opposing styles of the Duchess of Cambridge and the American Idol superstar. 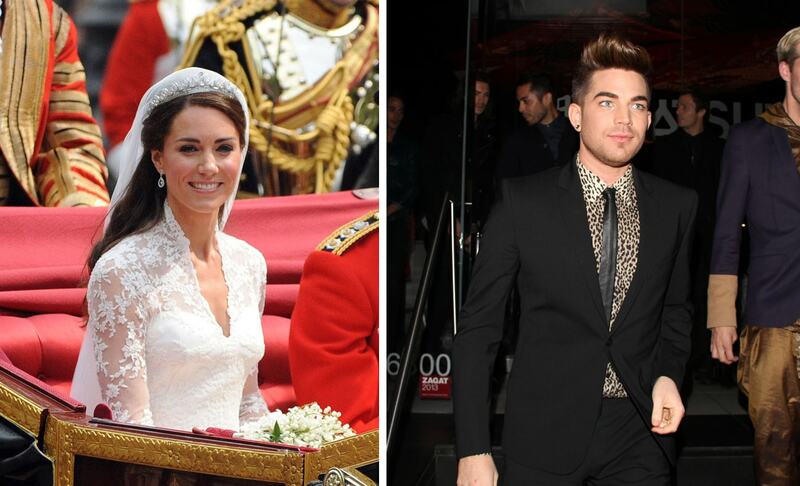 All eyes were on these two when they first hit the scene: Adam Lambert became a household name when he was on American Idol and Kate Middleton, now the Duchess of Cambridge, skyrocketed to worldwide fame when she became engaged to and then married Prince William. These two famous people have iconic styles that couldn’t possibly be more different. So let’s mix them up and see what happens! This picture of Kate was obviously taken on her wedding day. (Who could forget that polished, perfectly feminine Alexander McQueen gown?) The photo of Adam is from a slightly less important occasion, a night out in Hollywood, but it shows his signature edgy take on a tailored suit. Kate likes sweet, feminine pieces, and this lacy shirt in a fall-appropriate hue fits her style. The earrings are a little bolder than what Kate would usually wear; they incorporate some of Adam’s edgy influence. The cool headband represents Kate’s crown, but I think Adam would appreciate the embellishment. I finished the look with Adam-esque ripped jeans and Kate’s signature platform pumps. This outfit would be great in the fall when it starts getting colder! For this set, I took inspiration from Kate and Adam’s go-to fall looks. Kate loves to wear her polished, bright, belted coats and Adam looks great in leather! Kate’s mid-length coats are so stylish and quite versatile because they almost act as dresses. She loves them in bold colors (I think she’d approve of this red one), which works great for this combo as Adam’s style is very accommodating to pops of color! Adam also loves glitter, so put some glitter eye shadow on for a night out. This leather skirt also screams Adam, incorporating his signature fabric. Although the boots seem like they were inspired by one of Adam’s outfits, they’re actually inspired by Kate! She likes to wear tights with knee-high suede boots and I love the combination. Wear a blouse or graphic tee underneath the coat for a final hint of Adam’s look. Look 3: Combination of Look 1 and Look 2! For our last look, we have a girly outfit set with pops of color and a little edge. 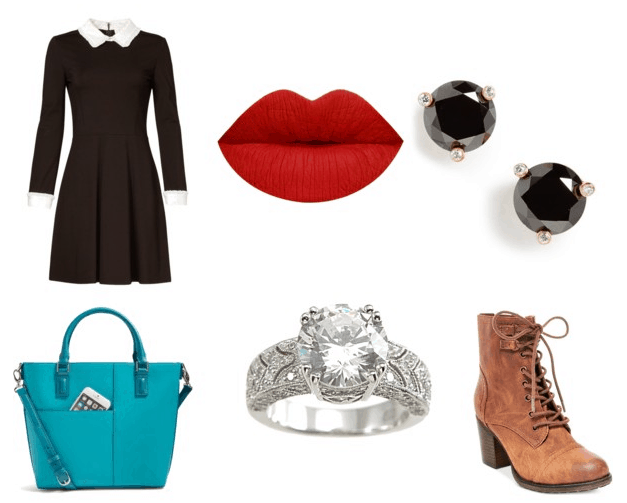 Here I combined a Kate-esque peter pan collar dress with edgy earrings, boots, and a red lip to channel Adam’s vibe. The structured tote is so Kate, but the bright color is very Adam. And of course, I had to finish with a sparkling bauble for a royal touch. Who would you like to see crossed next? Give me your craziest ideas in the comments below! Who knows, your suggestion could be our next article.